Doc Duracoat: Matching boat guns. This revolver was stored on a boat and was a rusted piece of junk. The shotgun only had rust and pitting under the wood. After sanding, degreasing and painting they are both ready for years of boat storage they will not rust after duracoating! 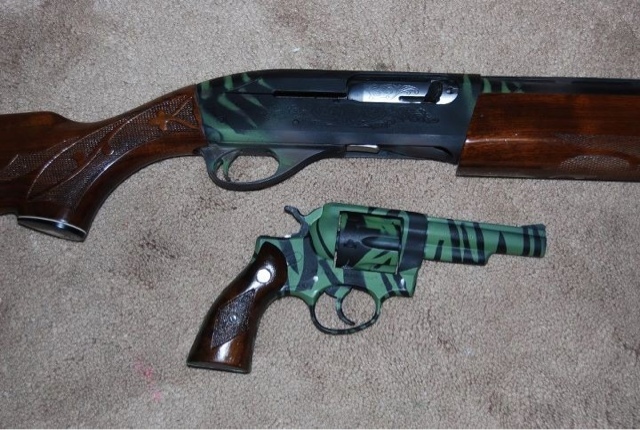 Matching boat guns. This revolver was stored on a boat and was a rusted piece of junk. The shotgun only had rust and pitting under the wood. After sanding, degreasing and painting they are both ready for years of boat storage they will not rust after duracoating! WASR AK-47 in "beaming blue"
SKS in 3 color "Florida tiger stripe"